Resizor is a small standalone app for image resizing and image retargeting. Photoshop is great tool, but it is bulky and expensive, by the time it loads you can finish resizing images with other tools like this one. 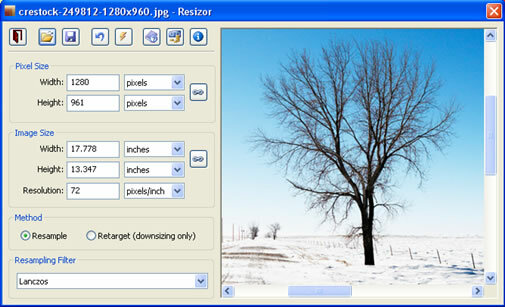 Resizor as the name suggests it just does the image resizing, it also features the seam carving technology for image retargeting. If you don’t know about retargeting, it is technique used to resize the images with out losing the quality of the image. You can use filters for resampling of images for superior quality, resizor claims that some of these filters offer superior quality than photoshop. Resizor is a standalone app and doesn’t need any install, currently available only for Windows. Thanks for the info on this app. I have been looking to resize some images and have yet to transfer Photoshop from my old computer to the new one. This should work great until I do.